Many people look into Human Design for answers to questions they’re struggling with. Are you one of those people? Are you looking for solutions to challenges, or have you simply realized that something seems “off” with the world and there’s a mystery to solve? Most people feel extensive validation and relief when they discover their Human Design. Part of this is because it shows them the keys to what makes them special, unique, and different! Finally they can stop berating themselves for a perceived sense of wrongness and see why they don’t seem to “fit in”—why they’re at odds with and struggle with social conventions. The other reason is that the world still operates on principles that served the seven-centered being but are no longer appropriate for our changing world. This concept of the seven “chakras” is derived from the Hindu-Brahmin chakra system, an ancient tradition that first recognized chakras as energy centers within the subtle body. In Human Design, Centers are focal points, or hubs, that receive and transform the energy that circulates throughout the BodyGraph. Each of the nine Centers of the Bodygraph has its own distinct biological correlation, i.e. the Splenic Center is connected to the lymphatic system, and the Root Center to the Adrenal Glands. Centers operate in different ways depending on the way these centers are defined or undefined. Note that the physical location in the bodygraph of the Solar Plexus and Splenic Centers does not correspond to the location in the body. These Centers are split to either side so that the beautiful symmetry of streams of awareness flowing through them can be clearly shown. In 1781, along with the discovery of the planet Uranus, humanity began to shift from a seven-centered to a more highly evolved, nine-centered form. 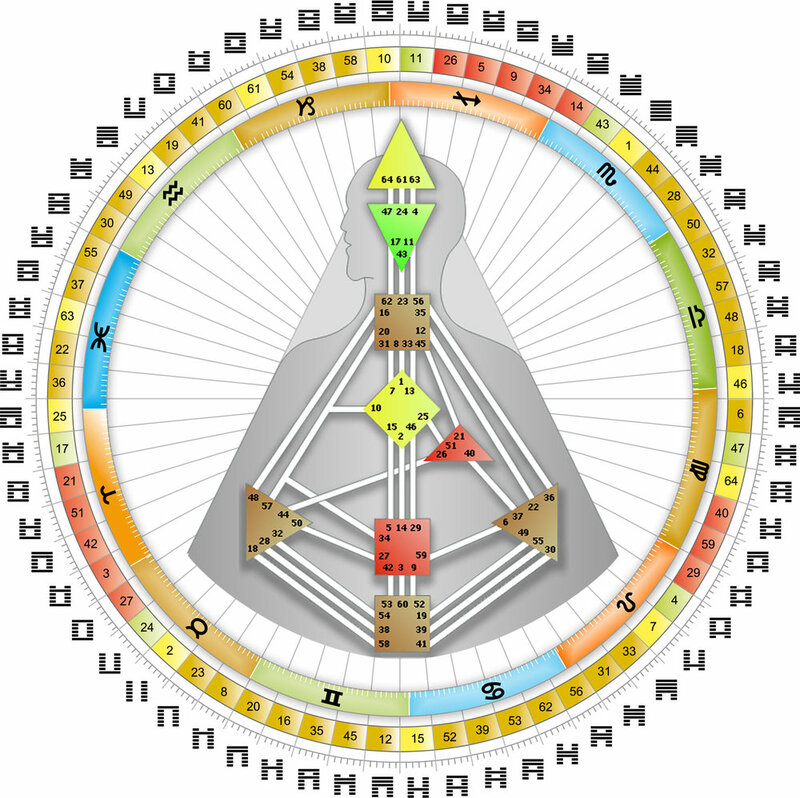 Ra used the term "Rave" to describe this 9-Centered being, of which we (until 2027) are a transitional form that is here to birth this new kind of human (that's another story we're going to learn about soon). Part of the mutation took place in the Ajna Center, changing the way our brain takes in information. All centers went through an upgrade; we as 9-Centered are an evolution of the older model of humans that came before. Because of our mutative process, we function differently from human beings born before 1781. Grasping this concept of our evolution tells us the myths, beliefs and concepts that originated with the seven-centered beings are outmoded models that no longer fully serve us. In the Complete Guide to the Human Design System, founder Ra explains our evolutionary transition from that seven-centered being to the present nine-centered being. Human Design is here to educate our kind—Ra called us Homo-Sapiens in Transitus—to release us from the outdated, fear-based, seven-centered mindset. The seven-centered being had a survival intelligence that used fear as a prime motivator to control the world. The tradition of the seven-centered being was very focused on the Manifestor style of leadership: take charge, conquer, manipulate and control to triumph. “And when you rule the world, when all the beasts bow down when they suffer at your hand, then what do you do—you try to rule each other. And all the killing that you used, that strategic power of communication and vision just leads to all this bloodshed and horror. This is the strategic way. It knows no other way. It does not. It takes time for our collective consciousness to let go of the age-old dogmas and traditions of fear-mongering and control. We nine-centered humans are not here to live in perpetual fear for our survival. Each of us can step on the path of evolving our consciousness. It takes letting go of the deep-seated conditioning living on in our minds, through myths, fairy tales, and modern-day movies—learning to see what’s really going on rather than letting others (like the talking heads on TV) tell us what’s going on. It takes courage, commitment, and dedication to living your truth. We’re waking up. We’re breaking free of the fear-based strategies the mind uses to protect itself from remembered pain or possible suffering. We don’t see things as they are when we’re lost in the Maia (Illusion). Instead, we see a distortion created by conditioning. We are in a "Rave" form, a Nine-Centered Being. Using the tools of Human Design, we can pinpoint the details of how your mind is wired to operate. It takes a simple decision to let go of trying to be in control with your mind. Being present, observing what is actually happening; being in touch with your body, and breathing can facilitate awareness, self-acceptance and allow you to let go. Through being aware we create the foundation for a clear perspective and appropriate action/non-action that arises in harmony with the totality and in alignment with our true nature. When you follow Strategy and Authority, you get to see the truth and the grace of “No Choice” because you are following the energetics of your body rather than the dictates of your mind. I bought and watched Ra’s Complete Guide to the Human Design System Video Series in 2014. It covers in depth the concepts of seven-centered vs. nine-centered beings and the coming of the Rave being in 2027. It is a great foundational course, I recommend it. A version of this article was written for and originally published on JovianArchive.com.